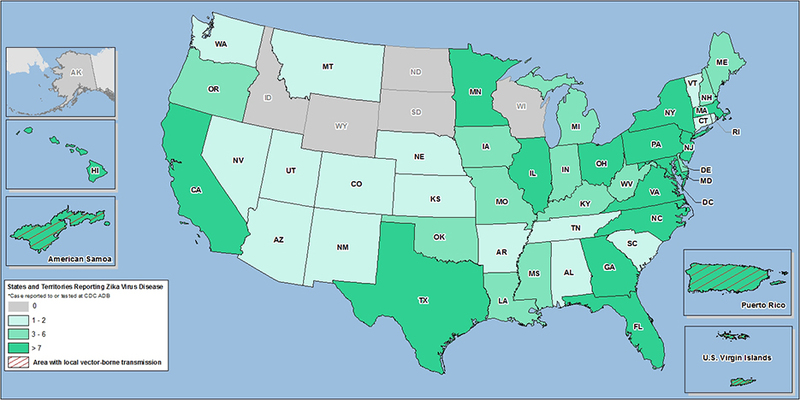 Zika virus disease is a nationally notifiable condition. 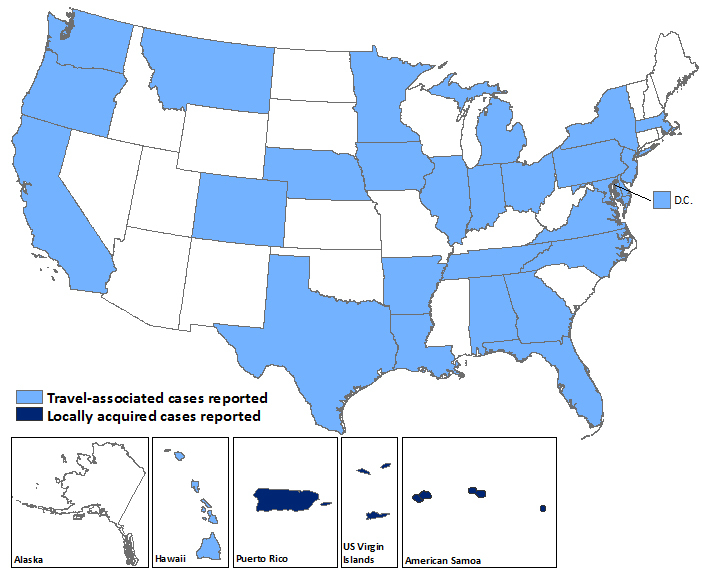 Cases are reported to CDC by state and local health departments. This update from the CDC Arboviral Disease Branch includes provisional data reported to ArboNET for January 1, 2015 – February 3, 2016. 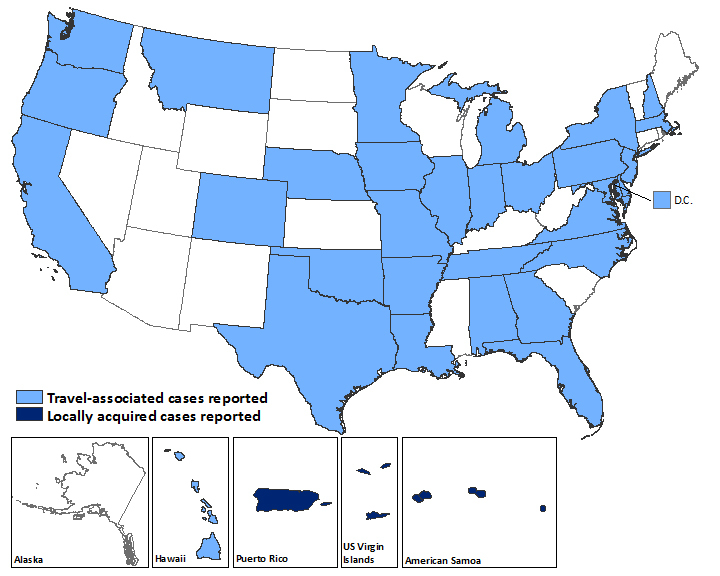 To date, 9 locally acquired cases and 1 travel-associated case have been reported from U.S. territories, including Puerto Rico and the U.S. Virgin Islands. This update from the CDC Arboviral Disease Branch includes provisional data reported to ArboNET for January 1, 2015  February 10, 2016. This update from the CDC Arboviral Disease Branch includes provisional data reported to ArboNET for January 1, 2015  February 17, 2016. This update from the CDC Arboviral Disease Branch includes provisional data reported to ArboNET for January 1, 2015 – March 2, 2016. 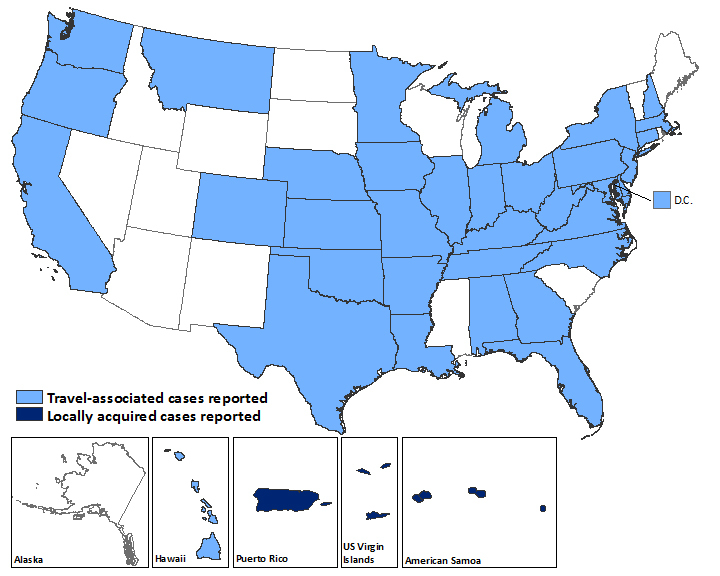 This update from the CDC Arboviral Disease Branch includes provisional data reported to ArboNET for January 1, 2015 – March 9, 2016. 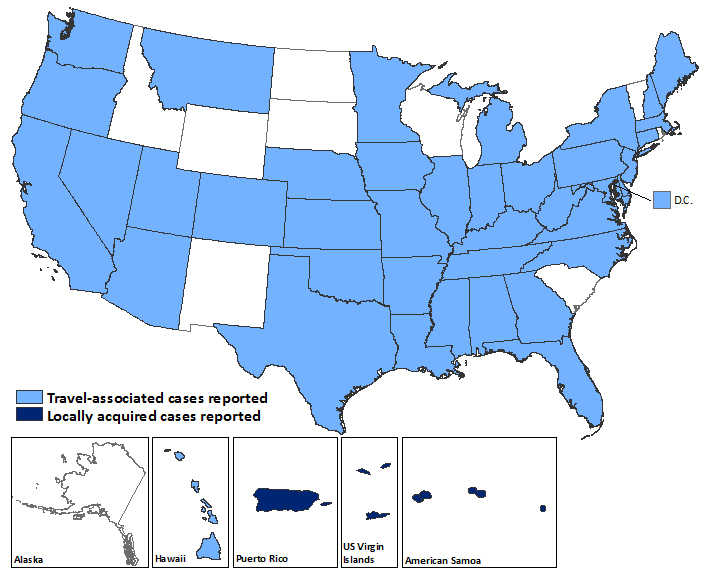 This update from the CDC Arboviral Disease Branch includes provisional data reported to ArboNET for January 1, 2015 – March 16, 2016. 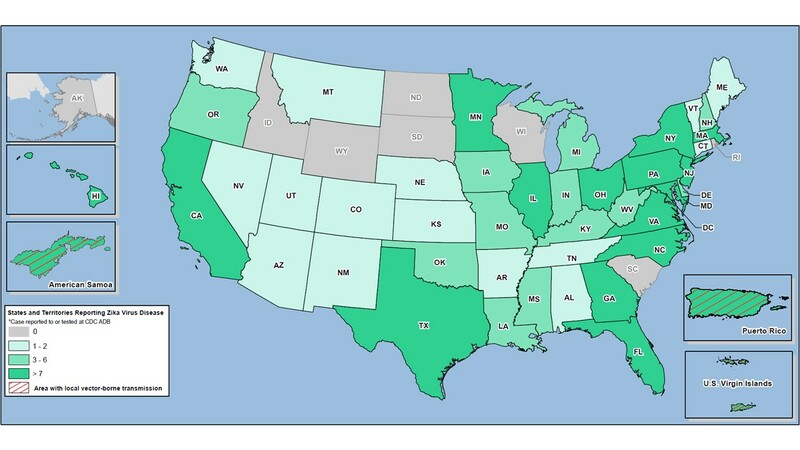 This update from the CDC Arboviral Disease Branch includes provisional data reported to ArboNET for January 1, 2015 – March 23, 2016. This update from the CDC Arboviral Disease Branch includes provisional data reported to ArboNET for January 1, 2015 – March 30, 2016. This update from the CDC Arboviral Disease Branch includes provisional data reported to ArboNET for January 1, 2015 – April 6, 2016. This update from the CDC Arboviral Disease Branch includes provisional data reported to ArboNET for January 1, 2015 – April 13, 2016. This update from the CDC Arboviral Disease Branch includes provisional data reported to ArboNET for January 1, 2015  April 20, 2016. This update from the CDC Arboviral Disease Branch includes provisional data reported to ArboNET for January 1, 2015 – April 27, 2016. This update from the CDC Arboviral Disease Branch includes provisional data reported to ArboNET for January 1, 2015 – May 11, 2016.